Start by putting the almonds in a food processor and pulse until finely chopped. Add in the powdered sugar and powdered color and give it a few pulses to combine. Set aside. Place macaron batter into a piping bag fit with a large, round tip and pipe small circles (about 1 inch to 1 ½ inches in diameter) onto your prepared baking sheets. 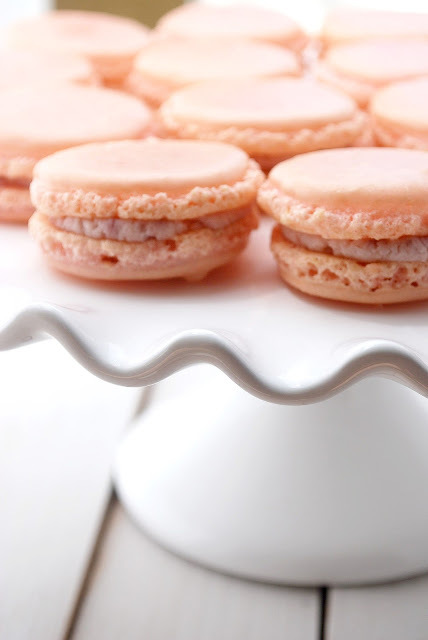 Let macarons rest for at least 45 minutes to an hour, or until a hard shell has developed on the top. You can test this by carefully brushing your finger over a macaron. If it feels dry, you’re ready to go. If not, give it another 15 minutes. Meanwhile, preheat your oven to 300F.\n\nBake for 9-11 minutes, one baking sheet at a time. Let cool completely before filling. Match up cool macaron shells by size. In a small bowl combine mascarpone and preserves. Place in a piping bag and pipe a swirl of filling on one shell. Place matching shell on top of the filling and give it light pressure. Repeat with remaining shells and filling. Chill macarons in the fridge overnight so flavors can meld.